Dutch verb clusters typically occur when a main verb is combined with one or more auxiliaries in the same (sub)clause. 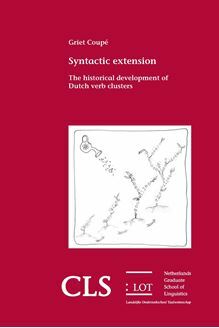 This dissertation provides a diachronic account of these Dutch verb clusters, focusing specifically on the auxiliaries hebben and zullen. The diachronic development of these auxiliaries is characterised by an increase in semantic scope. From a syntactic point of view, these auxiliaries form an increasingly tight syntactic unit with their verbal complements. This study focuses on three Dutch dialects in the period between 1300 and 1600. Two syntactic innovations in these dialects are studied: the development of the double modal construction and the development of the Infinitivus Pro Participio-effect. It is argued that both innovations are made possible by the scope increase of auxiliaries like hebben and zullen. This leads to an increasing number of verbs that may appear in the complement of these auxiliaries, yielding longer verb clusters. While the verb order is variable both in two-verb clusters and in long verb clusters, long clusters almost invariably have the finite verb before its immediate complement and show a clear preference for the 1-2-3-(4) order. The preposing of the finite verb is explained as avoidance of syntagm ambiguity, while the ‘linear order’ is assumed to be an effect of a preference in long clusters to reflect the underlying syntactic hierarchy. It is argued that the increasing frequency of long verb clusters with 1-2-3-(4) order may have contributed to the rise of the 1-2 order that is witnessed in two-verb clusters.